Glacier National Park is a stunningly beautiful ice-carved terrain of ridges, peaks, and valleys located in the U.S. state of Montana, bordering the Canadian provinces of Alberta and British Columbia. Set in Rocky Mountain wilderness, Glacier National Park straddles the Continental Divide and contains two mountain ranges, over 130 named lakes, more than 1,000 different species of plants, and hundreds of species of animals. This vast pristine ecosystem, spread across 1,584 mi² (4,101 km²) - 1,013,572 acres – is the centerpiece of what has been referred to as the "Crown of the Continent Ecosystem," a region of protected land encompassing 16,000 mi² (44,000 km²). Glacier National Park borders Waterton Lakes National Park in Canada—the two parks jointly share the name Waterton-Glacier International Peace Park. In recognition of the bonds of friendship and peace between neighbors, the parks were designated as the world's first International Peace Park in 1932. Both parks were designated by the United Nations as Biosphere Reserves in 1976, and in 1995 as World Heritage Sites. Saint Mary Lake is the second largest lake in the park, after Lake McDonald. 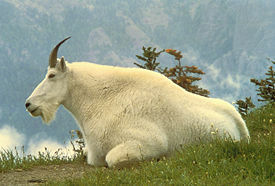 The Mountain Goat is the official symbol of Glacier National Park. According to archeological evidence, Native Americans first arrived in the Glacier area some 10,000 years ago. The earliest occupants with lineage to current tribes were the Salish, Flathead, Shoshone, and Cheyenne. The Blackfoot arrived around the beginning of the 18th century and soon dominated the eastern slopes of what later became the park, as well as the Great Plains immediately to the east. The park region provided the Blackfoot shelter from the harsh winter winds of the plains, and supplemented their traditional bison hunts with other game meat. Today, the Blackfoot Indian Reservation borders the park in the east, while the Flathead Indian Reservation is located west and south of the park. When the Blackfoot Reservation was first established in 1855 by the Lame Bull Treaty, it included the eastern area of the current park up to the Continental Divide. Sacred to the Blackfoot, the mountains of this area, especially Chief Mountain and the region in the southeast at Two Medicine, were considered the "Backbone of the World" and were frequented during vision quests and prayer ceremonies. In 1895, Chief White Calf of the Blackfoot authorized the sale of the mountain area, some 800,000 acres (3,200 km²), to the U.S. government for $1.5 million. This established the current boundary between the park and the reservation. The Going-to-the-Sun Road as seen above McDonald Valley. While exploring the Marias River in 1806, the Lewis and Clark Expedition came within 50 miles (80 km) of the area that is now the park. A series of explorations after 1850 helped to shape the understanding of the area that later became the park. George Bird Grinnell came to the region in the late 1880s and was so inspired by the scenery that he spent the next two decades working to establish a national park. In 1901, Grinnell wrote a description of the region, in which he referred to it as the "Crown of the Continent," and his efforts to protect the land make him the premier contributor to this cause. A few years after Grinnell first visited, Henry L. Stimson and two companions, including a Blackfeet Indian, climbed the steep east face of Chief Mountain in 1892. In 1891, the Great Northern Railway crossed the Continental Divide at Marias Pass (5,213 ft/1,589 m), which is along the southern boundary of the park. In an effort to stimulate use of the railroad, the Great Northern soon advertised the splendors of the region to the public. The company lobbied the United States Congress, and in 1900, the park was designated as a forest preserve. Under the forest designation mining was still allowed, but was not commercially successful. Meanwhile, proponents of protecting the region kept up their efforts, and in 1910, under the influence of George Bird Grinnell, Henry L. Stimson and the railroad, a bill was introduced into the U.S. Congress, which re-designated the region from a forest preserve to a national park. This bill was signed into law by President William Howard Taft on May 11, 1910, establishing Glacier as the country’s 10th national park. The Great Northern Railway, under the supervision of president Louis W. Hill, built a number of hotels and chalets throughout the park in the 1910s to promote tourism. These buildings, constructed and operated by a Great Northern subsidiary called the Glacier Park Company, were modeled on Swiss architecture as part of Hill's plan to portray Glacier as "America's Switzerland." Vacationers commonly took pack trips on horseback between the lodges or utilized the seasonal stagecoach routes to gain access to the Many Glacier area in the northeast. Road construction along the Going-to-the-Sun Road with Going to the Sun Mountain in background, 1932. Between 1910 and 1913, about a dozen chalets and hotels were built, some in remote backcountry locations accessible only by trail. Today, only three are still in operation, while a fourth has been converted to a store. The surviving chalet and hotel buildings within the park are now designated as National Historic Landmarks. In total, 350 buildings and structures within the park are listed on the National Register of Historic Places, including ranger stations, backcountry patrol cabins, fire lookouts, and concession facilities. 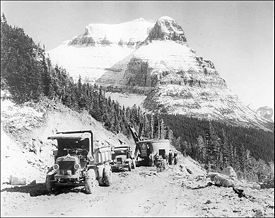 After the park was well established and visitors began to rely more on automobiles, work was begun on the 53 mile (85 km) long Going-to-the-Sun Road, completed in 1932. Also known simply as the Sun Road, the road bisects the park and is the only route that ventures deep into the park, going over the Continental Divide at Logan Pass (6,670 feet, 2033 m) at the midway point. This is often called one of the most awe-inspiring 50 miles in the United States. 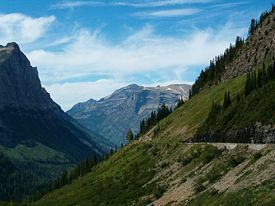 The Sun Road is also listed on the National Register of Historic Places, and in 1985 was designated a National Historic Civil Engineering Landmark. Another route, along the southern boundary between the park and National Forests is U.S. Route 2, which crosses the Continental Divide at Marias Pass and connects the towns of West Glacier and East Glacier. During the 1930s, the Civilian Conservation Corps assisted in the development of many of the park's trails and campgrounds. The increase in motor vehicle traffic through the park during the 1930s also resulted in the construction of new concession facilities at Swiftcurrent and Rising Sun, both designed for automobile-based tourism. These early "auto camps" are now also listed on the National Register. 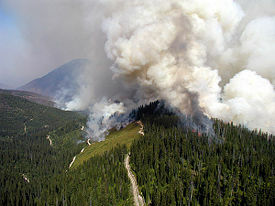 In 2003, wildfires on the western side of the Continental Divide burned ten percent of Glacier National Park. 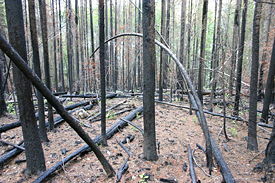 There were also extensive fires in the surrounding forests. Glacier National Park is managed by the National Park Service; park headquarters is in West Glacier, Montana. The National Park Service has the smallest staff of any major federal agency, yet oversees over 84 million acres (340,000 km²). Visitation to Glacier National Park averages slightly less than 2 million visitors annually, however relative few venture far from main roadways and hotels. The mandate of the National Park Service, a federal agency since August 1916, is to "preserve, protect, and share the history of this land and its people." The Park Service employs archeologists, architects, curators, historians, and other cultural resource professionals; and together they work in conjunction with American Indian tribes, states, local governments, nonprofit organizations, historic property owners, and others who believe in the importance of our shared heritage – and its preservation. In keeping with this mandate, hunting is illegal in the park, as are mining, logging, and removal of natural or cultural resources. Additionally, oil and gas exploration and extraction are not permitted. In 1974, a wilderness study was submitted to congress, which identified 95 percent of the park's area as qualifying for wilderness designation. Unlike a few other parks, Glacier National Park has yet to be protected as wilderness, but National Park Service policy requires that identified areas listed in the report be managed as wilderness until Congress renders a full decision. In anticipation of the 100th anniversary of the park in 2010, major reconstruction of the Going-to-the-Sun Road is underway. Some rehabilitation of major structures such as visitor centers and historic hotels, as well as improvements in wastewater treatment facilities and campgrounds, are expected to be completed by the anniversary date. Also planned are fishery studies for Lake McDonald, updates of the historical archives, and restoration of trails. 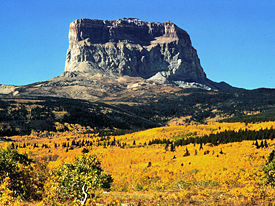 Chief Mountain is an isolated peak on the easternmost boundary of the park. The park is bordered on the north by Waterton Lakes National Park in Alberta, Canada and the Flathead Provincial Forest and Akamina-Kishinena Provincial Park in British Columbia. To the west, the north fork of the Flathead River forms the western boundary, while its middle fork is part of the southern boundary. The Blackfeet Indian Reservation provides most of the eastern boundary, and the Lewis and Clark and the Flathead National Forests form the southern and western boundary. The remote Bob Marshall Wilderness Complex is located in the two forests immediately to the south. The park contains a dozen large lakes and 700 smaller ones, but only 131 lakes have been named. Lake McDonald, St. Mary Lake, Bowman Lake, and Kintla Lake are the four largest lakes. Numerous smaller lakes, known as tarns, are located in cirques formed by glacial erosion. Some of these lakes, like Avalanche Lake and Cracker Lake, are colored an opaque turquoise by suspended glacial silt, which also causes a number of streams to run milky white. The lakes of Glacier National Park remain cold year round, with temperatures rarely above 50 °F (10 °C) at their surface. Cold water lakes such as these support little plankton growth, ensuring that the lake waters are remarkably clear. The lack of plankton, however, lowers the rate of pollution filtration, and pollutants have a tendency to linger longer. Consequently, the lakes are considered environmental "bellweathers" as they can be quickly affected by even minor increases in pollutants. Two hundred waterfalls are scattered throughout the park, however, during dryer times of the year, many of these are reduced to a trickle. The largest falls include those in the Two Medicine region, McDonald Falls in the McDonald Valley and Swiftcurrent Falls in the Many Glacier area, which is easily observable and close to the Many Glacier Hotel. One of the tallest waterfalls is Bird Woman Falls, which drops 492 feet (150 m) from a hanging valley beneath the north slope of Mount Oberlin. Bird Woman Falls can be easily seen from the Going-to-the-Sun Road. The rocks found in the park are primarily sedimentary in origin, having been laid down in shallow seas over 1.6 billion to 800 million years ago. During the formation of the Rocky Mountains the Lewis Overthrust, commencing 170 million years ago, moved an enormous region of rocks three miles (4.8 km) thick and 160 miles (257 km) long, eastward more than 50 miles (80 km). This resulted in older rocks being displaced over newer ones, and today the overlying Proterozoic rocks are over 1.4 billion years older than the underlying Cretaceous age rocks. 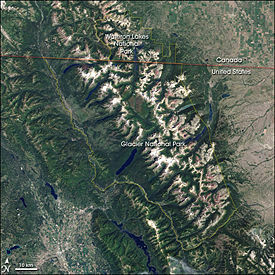 Landsat 7 image of Waterton-Glacier International Peace Park. The Rocky Mountain Front formed by the Lewis Overthrust fault rises dramatically above the Great Plains on the right. One of the most dramatic evidences of this overthrust is visible in the form of Chief Mountain, an isolated peak on the edge of the eastern boundary of the park rising 4,500 feet (1,372 m) above the Great Plains. There are seven mountains in the park over 10,000 feet (3,048 m) in elevation, with Mount Cleveland at 10,466 feet (3,190 m) being the tallest. Appropriately named Triple Divide Peak sends waters towards the Pacific Ocean, Hudson Bay, and Gulf of Mexico watersheds, and can effectively be considered to be the apex of the North American continent, although the mountain is only 8,020 feet (2,444 m) above sea level. The rocks in Glacier National Park are considered the best preserved Proterozoic sedimentary rocks in the world, and have proved to be some of the world's most fruitful sources for records of early life. Sedimentary rocks of similar age located in other regions have been greatly altered by mountain building and other metamorphic changes, and consequently fossils are less common and more difficult to observe. The rocks in the park preserve such features as millimeter-scale lamination, ripple marks, mud cracks, salt-crystal casts, raindrop impressions, oolites, and other sedimentary bedding characteristics. Six fossilized species of Stromatolites, which were early organisms consisting primarily of blue-green algae, have been documented and dated at about one billion years. The discovery of the Appekunny Formation, a well preserved rock stratum in the park, pushed back the established date for the origination of animal life a full billion years. This rock formation has bedding structures which are believed to be the remains of the earliest identified metazoan (animal) life on Earth. Glacier National Park is dominated by mountains which were carved into their present shapes by the huge glaciers of the last ice age; these glaciers have largely disappeared over the 15,000 years. Evidence of widespread glacial action is found throughout the park in the form of U-shaped valleys, glacial cirques, arêtes, and large outflow lakes radiating like fingers from the base of the highest peaks. Since the end of the ice ages, various warming and cooling trends have occurred. The last recent cooling trend was during the Little Ice Age, which took place approximately between 1550 and 1850. During the Little Ice Age, the glaciers in the park expanded and advanced, although to nowhere near as great an extent as they had during the Ice Age. Coincidentally, the park region was first explored in detail near the end of the Little Ice Age and a systematized survey began in which the number and size of glaciers was documented on maps and by photographic evidence. Much of this late nineteenth century work, however, was undertaken to lure tourism into the region or to search for mineral wealth, not out of a particular desire to document glaciers. During the middle of the twentieth century, examination of the maps and photographs from the previous century provided clear evidence that the 150 glaciers known to have existed in the park a hundred years earlier had greatly retreated, and in many cases disappeared altogether. Repeat photography of the glaciers, such as the pictures taken of Grinnell Glacier between 1938 and 2005 as shown, help to provide visual confirmation of the extent of glacier retreat. After the end of the Little Ice Age in 1850, the glaciers in the park retreated moderately until the 1910s. Between 1917 and 1926, the retreat rate rose rapidly and continued to accelerate through the 1930s. A slight cooling trend from the 1940s until 1979 helped to slow the rate of retreat and in a few examples some glaciers even advanced a few tens of meters. However, during the 1980s, the glaciers in the park began a steady period of loss of glacial ice, which continues into the 2000s. In 1850, the glaciers in the region near Blackfoot and Jackson Glaciers covered 5,337 acres (21.6 km²), but by 1979, the same region of the park had glacier ice covering only 1,828 acres (7.4 km²). Between 1850 and 1979, 73 percent of the glacial ice had melted away. At the time the park was created, Jackson Glacier was part of Blackfoot Glacier, but the two separated into different glaciers by 1939. The impact of glacier retreat on the park's ecosystems is not fully known, but cold–water–dependent plant and animal species could suffer due to a loss of habitat. Reduced seasonal melting of glacial ice may also affect stream flow during the dry summer and fall seasons, reducing water table levels and increasing the risk of forest fires. The loss of glaciers will also reduce the aesthetic visual appeal that glaciers provide to visitors. Many areas of the park are accessible only during the summer, and possibly the late spring and early fall, depending on snowfall and elevation. Rainfall is frequent in the tourist season during the summer and may persist for days, averaging two to three inches (5–7.6 cm) each month. Snowfall can occur at any time of the year, even in the summer, and especially at higher altitudes. Thunderstorms, with lightning and hail, are common throughout the summer. The mountainous terrain ensures that tornadoes are very rare. The winter can bring prolonged cold waves, especially on the eastern side of the Continental Divide. Snowfalls are significant over the course of the winter, with the largest accumulation occurring in the west. During the tourist season daytime high temperatures average in the 60s and 70s °F (15 to 25°C), and nighttime lows usually drop into the 40s (7°C). Temperatures in the high country may be much cooler. In the lower valleys, on the other hand, daytime highs over 90°F (32°C) are not unusual. Glacier is considered to have excellent air and water quality. No major areas of dense human population exist anywhere near the region and industrial effects are minimized due to a scarcity of factories and other potential contributors of pollutants. However, the sterile and cold lakes found throughout the park are easily contaminated by airborne pollutants that fall whenever it rains or snows, and some evidence of these pollutants have been found in park waters. The pollution level is currently viewed as negligible, and the park lakes and waterways have a water quality rating of A-1, the highest rating given by the state of Montana. Beargrass is a tall flowering plant commonly found throughout the park. Glacier is part of a large preserved ecosystem collectively known as the "Crown of the Continent Ecosystem," all of which is primarily untouched wilderness of a pristine quality. Virtually all the plants and animals which existed at the time white explorers first entered the region are present in the park today. A total of over 1,132 plant species have been identified park-wide. The predominantly coniferous forest is home to various species of trees such as the Engelmann spruce, Douglas fir, subalpine fir, limber pine, and western larch (a deciduous conifer, producing cones but losing its needles each fall). Cottonwood and aspen are the more common deciduous trees and are found at lower elevations, usually along lakes and streams. The timberline on the eastern side of the park is almost 800 feet (244 m) lower than on the western side of the Continental Divide, due to exposure to the colder winds and weather of the Great Plains. West of the Continental Divide, the forest receives more moisture and is more protected from the winter, resulting in a more densely populated forest with taller trees. Above the forested valleys and mountain slopes, alpine tundra conditions prevail, with grasses and small plants eking out an existence in a region that enjoys as little as three months without snow cover. Thirty species of plants are found only in the park and surrounding National Forests. 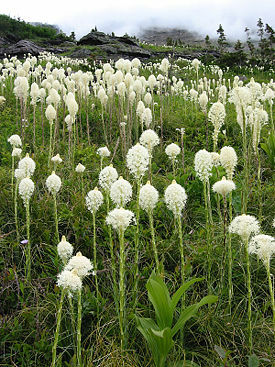 Beargrass, a tall flowering plant, is commonly found near moisture sources, and is relatively widespread during July and August. Spectacular wildflowers such as monkeyflower, glacier lily, fireweed, balsamroot, and Indian paintbrush are also common and on display throughout the summer months. The forested sections fall into three major climatic zones. 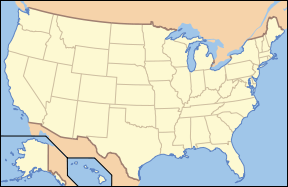 The west and northwest are dominated by spruce and fir and the southwest by redcedar and hemlock; the areas east of the Continental Divide are a combination of mixed pine, spruce, fir, and prairie zones. 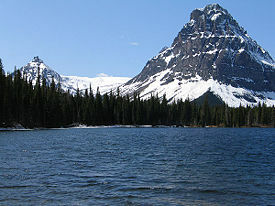 The cedar-hemlock groves along the Lake McDonald valley are the easternmost examples of this Pacific climatic ecosystem. 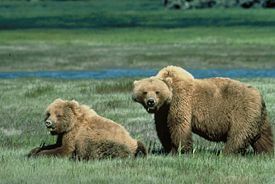 The Grizzly bear is a threatened species; approximately 300 are believed to exist in the park. Virtually all the historically known plant and animal species, with the exception of the American bison and woodland caribou, are present, providing biologists an intact ecosystem for plant and animal research. Two threatened species of mammals, the grizzly bear and the Canadian lynx, are found in the park. Although their numbers remain at historical levels, both are listed as threatened because in virtually every other region of the U.S. outside of Alaska, they are either extremely rare or absent from their historical range. Other large mammals such as the mountain goat (the official park symbol), bighorn sheep, moose, elk, mule deer, white-tailed deer, coyote, and the rarely seen mountain lion, are either plentiful or common. Unlike in Yellowstone National Park, which commenced a wolf reintroduction program in the 1990s, wolves have existed almost continuously in Glacier. In all, 62 species of mammals have been documented including badger, river otter, porcupine, mink, marten, fisher, six species of bats, and numerous other smaller mammals. A total 260 species of birds have been recorded, with raptors such as the bald eagle, golden eagle, peregrine falcon, osprey, and several species of hawks residing year-round. The harlequin duck is a colorful species of waterfowl found in the lakes and waterways. The great blue heron, tundra swan, Canadian goose, and American wigeon are species of waterfowl more commonly encountered in the park. Great horned owl, Clark's nutcracker, Steller's jay, pileated woodpecker, and cedar waxwing reside in the dense forests along the mountainsides, and in the higher altitudes, the ptarmigan, timberline sparrow, and rosy finch are the most likely to be seen. The Clark's nutcracker is less plentiful than in past years due to the reduction in the number of whitebark pines. Because of the colder climate, ectothermic reptiles are all but absent, with two species of garter snakes and the western painted turtle being the only three reptile species proven to exist. Similarly, only six species of amphibians are documented, although those species exist in large numbers. After a forest fire in 2001, a few park roads were temporarily closed the following year to allow thousands of Western toads to migrate to other areas. Glacier is also home to the endangered bull trout, which is illegal to possess and must be returned to the water if caught inadvertently. A total of 23 species of fish reside in park waters and native game fish species found in the lakes and streams include the cutthroat trout, northern pike, mountain whitefish, Kokanee salmon, and grayling. Introduction in previous decades of Lake trout and other non-native fish species have greatly impacted some native fish populations, especially the bull trout and west slope cutthroat trout. Forest fires were viewed for many decades as a threat to protected areas such as forests and parks. As a better understanding of fire ecology developed after the 1960s, forest fires were understood to be a natural part of the ecosystem. The earlier policies of suppression resulted in the accumulation of dead and decaying trees and plants which would normally have been reduced had fires been allowed to burn. Many species of plants and animals actually need wildfires to help replenish the soil with nutrients and to open up areas that allow grasses and smaller plants to thrive. Glacier National Park has a fire management plan, which ensures that human–caused fires are generally suppressed as they always have been. In the case of natural fires, the fire is monitored and suppression is dependent on the size and threat a fire may pose to human safety and structures. Major fires that require the assistance of other resources are coordinated through the National Interagency Fire Center. Increased population and the growth of suburban areas near parklands has led to the development of what is known as Wildland Urban Interface Fire Management, in which the park cooperates with adjacent property owners in improving safety and fire awareness. This approach is common to many protected areas. As part of this program, houses and structures near the park are designed to be more fire resistant. Dead and fallen trees are removed from areas that are near human habitation, reducing the available fuel load and the risk of a catastrophic fire, and advance warning systems are developed to help alert property owners and visitors about forest fire potentials during a given period of the year. In 2003, 136,000 acres (550 km²) burned in the park after a five-year drought and a summer season of almost no precipitation. This was the most acreage transformed by fire since the creation of the park in 1910. Two Medicine Lake with Sinopah Mountain. Glacier is distant from major cities, with the closest airport located in Kalispell, Montana, southwest of the park. Amtrak trains stop at East and West Glacier. A fleet of 1930s red tour buses, called jammers, offers tours on all the main roads in the park. The tour buses were rebuilt in 2001 to run on propane, lessening their environmental impact. Small wooden tour boats, some dating back to the 1920s, operate on several of the larger lakes. Hiking is a popular activity in the park, which more than half the park's visitors take part in. 110 miles (177 km) of the Continental Divide National Scenic Trail spans most of the distance of the park north to south, with a few alternate routes at lower elevations if high altitude passes are closed due to snow. Backcountry camping is allowed at campsites along the trails. The backcountry is usually closed in most areas until early June due to the potential risk of avalanches and many trails at higher altitudes are snow packed until July. Fishing is a popular activity in the park and some of the finest fly fishing in North America is reportedly found in the streams that flow through the park. Though the park requires that those fishing understand the regulations, no permit is required to fish the waters within the park boundary. The endangered bull trout must be released immediately back to the water if caught, otherwise, the regulations on limits of catch per day are liberal. 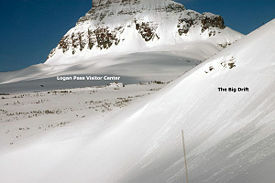 Winter recreation activities in Glacier are limited. Snowmobiling is not allowed anywhere in the park, but cross-country skiing and snowshoeing can be enjoyed in the lower altitude valleys on the east and western sides of the park. ↑ Crown of the Continent Ecosystem Education Consortium. Welcome to the Crown of the Continent Ecosystem Retrieved October 16, 2007. ↑ Manataka American Indian Council. The Blackfeet Nation. Retrieved October 16, 2007. ↑ Laura Soullière Harrison. 1986. Architecture in the Parks - Great Northern Railway Buildings. National Park Service, U.S. Department of the Interior. Retrieved October 16, 2007. ↑ Mark Hufstetler, Kathryn L. McKay, and Janet Cornish. 2002. Going-to-the-Sun Road, Glacier National Park, Montana Cultural landscape report. Butte, Mont: Renewable Technologies, Inc.
↑ Intergovernmental Panel on Climate Change, United Nations Environment Programme. 2001. Was there a Little Ice Age and a Medieval Warm Period? Retrieved October 16, 2007. ↑ U.S. Department of the Interior, U.S. Geological Survey. July 2, 2007. Monitoring and Assessing Glacier Changes and Their Associated Hydrologic and Ecologic Effects in Glacier National Park. Retrieved October 16, 2007. ↑ Myrna Hall, and Daniel Fagre. February 2003. Modeled Climate-Induced glacier change in Glacier National Park, 1850–2100; volume 53, issue 2. Bioscience. Retrieved October 16, 2007. ↑ National Weather Service. Top Ten Montana Weather Events of the 20th Century. Retrieved October 16, 2007. ↑ Daniel Fagre, April 25, 2003. Global Change Research A Focus on Mountain Ecosystems. U.S. Geological Survey, Northern Rocky Mountain Science Center. Retrieved October 16, 2007. ↑ Northern Rocky Mountain Science Center, U.S. Geological Survey. April 23, 2003. Whitebark Pine Communities. Retrieved October 16, 2007. ↑ Laura Hudson. Lynx inventories under way in the Intermountain Region. National Park Service. Retrieved October 16, 2007. ↑ Jeff Copeland, Rick Yates, and Len Ruggiero. June 16, 2003. Wolverine Population Assessment in Glacier National Park, Montana. Wolverine Foundation. Retrieved October 16, 2007. ↑ Jim Mann, January 27, 2006. Where the Bears Are. The Daily Inter Lake. Retrieved October 16, 2007. National Park Service. National Parks. Retrieved October 16, 2007. National Park Service. Glacier. Retrieved August 23, 2007. Sierra Club. Glacier National Park is a Global Warming Laboratory. Retrieved August 23, 2007. Canada. Waterton Lakes National Park of Canada. Retrieved August 23, 2007. Hall, Myrna H. and Daniel B. Fagre, Modeled Climate-Induced Glacier Change in Glacier National Park, 1850-2100. United State Geological Survey. Retrieved August 23, 2007. United State Geological Survey. Project Overview. Retrieved August 23, 2007. National Park Service. Glacier National Park. National Park Service. Glacier National Park Campground Status. History of "Glacier National Park (United States)"
This page was last modified on 23 June 2017, at 16:01.